Hello everyone! It is Crystal here from Crystal's Creative Corner. 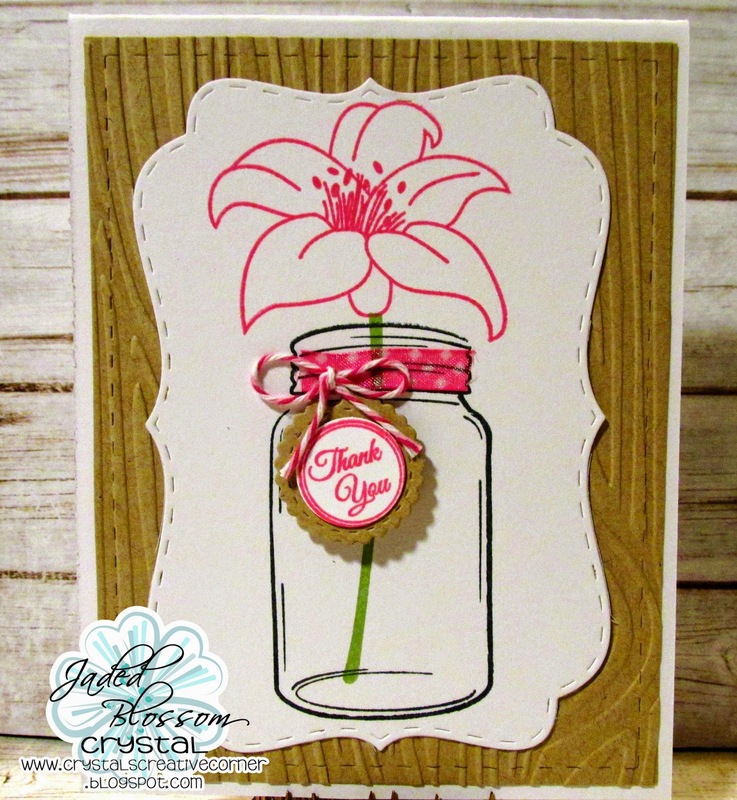 Today is my Jaded Blossom Design Team day and I have a thank you card to share with you! My dad passed away suddenly two weeks ago and many people have reached out to my family and I. I was thankful I was able to make a ton of these clean and simple thank you cards to send out rather quickly with the AMAZING Jaded Blossom Stamps & Dies. I used a little bit of ribbon on the jar and added a twine bow for an extra touch. I hope you enjoyed my card today. Thank you for stopping by! So sorry for your loss. But this is a beautiful card. I am so sorry for your loss. This is a simply but beautiful Thank You card. I am so sorry for your loss.~prayers to you and your family. Your card is beautiful Crystal. Sorry for your loss. Your card is beautiful! The versatile model par excellence for riders looking for an energetic ski that can do everything. Alexis Pinturault, Timberland Sale it is now the big crystal globe that is in focus in this new FIS Alpine Ski World Cup which starts this weekend in Sölden (Austria) with the added injury returns two champions world, Tessa Worley and Marion Rolland. Timberland Outlet online Après period promises and first harvest (22 podiums, including seven wins on the major circuit), "Pintu" knows, at 23, the time has come to hunt globes.